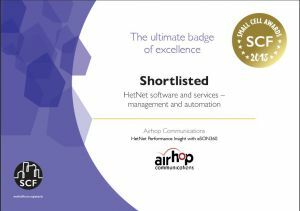 SAN DIEGO, CA – May 17, 2018 – AirHop’s eSON360 Analytics software platform is selected to the shortlist of candidates for the 2018 Small Cell Forum (SCF) HetNet Management Software and Services Award. eSON360 Analytics is a carrier-class fast data platform that enables Self-Organized Network (SON) analytics for performance insight across Heterogeneous Networks. The platform ingests a broad set of information across operator networks, providing both deep historical data and timely information to deliver impacting network performance insight and optimization. The Small Cell Forum industry award winners will be announced on May 22th at the gala dinner as part of the SCWS World exhibition and conference. For more information on the Small Cell Forum Industry Awards, please visit: https://www.smallcellforum.org/events/awards-2018/. AirHop is a leader in Self-Organizing Network (SON) solutions for dynamic network resource optimization and QoS/QoE management of heterogeneous wireless networks. AirHop is the first company to combine real-time SON features with traditional SON functionality. AirHop’s eSON and eSON360 Analytics fast data solutions are backed by a comprehensive portfolio of patents delivering flexible virtualized deployment, scalable software and algorithms, comprehensive APIs for multi-vendor support, and readiness to extend support into new technologies such as cloud-RAN and NFV. AirHop is privately held and based in San Diego, CA. For more information, please visit www.airhopcomm.com.